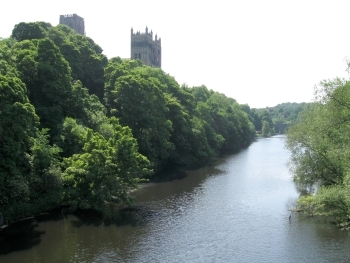 Was in the north east last weekend and went to Durham with Janet (see pixie, you do get mentioned). Haven’t been to Durham in many a year. Still as pretty and quirky as I recall, with at least one tiny pub with a bench down which one would slide if sat on. It seems obligatory to photograph the cathedral above the river. No photos of the nicer trees we found though. I suppose if you travel up and down between London and Newcastle often enough than problems are inevitable. The fact there seemed to be trains all over Newcastle station, and the ones heading north were running pretty late, should have been a clue but still. We were initially delayed a little because our driver was late getting up from the south. As we got closer and closer to York though it became more and more obvious that things were not working. I’m still not entirely clear what the actual problem was (the press seem to have ignored it—presumably because there weren’t any editors delayed on the way into work), but basically the route between York and Doncaster was shut (rumour was buckled lines due to, er, something). We sat for a while in the countryside outside York, and then crawled into the station. Where we sat. And sat. I understand that things were beyond National Express’s control but the information forthcoming was woeful. We were told that because we had a diesel train we would probably divert via Leeds. Then left to sit, no staff in sight (I strongly suspect they’d decamped rather than sit on a slowly steaming train). Eventually someone decided that, yes, we’d go via Leeds. Just as soon as we found a driver who knew the way (I believe there’s a rule about driver’s having to be trained [ha!] on the route they’re taking but you’d think they’d have all covered likely diversion routes in case). More waiting later they announced we had a driver and could anyone not travelling get off. Then we sat around some more. Finally we moved off via Leeds, the buffet car promptly running out of all stock, despite having sat at York station for enough time that they could have resupplied a small army. Having stated we wouldn’t actually call at Leeds they may have well as given we came to a stop at the station. Then we got to Doncaster, where apparently the information boards claimed we were stopping at Grantham, news to everyone already on the train. So we had to introduce another delay to make an unscheduled stop (they apologised for the late arrival into somewhere we were never meant to be though). Of course I dare not complain too much in case the government decide I’m a terrorist and lock me up, for 42 days, with no charge (I’m a terrorist, but they couldn’t possibly charge me with that. Any regular readers will of course realise my total opposition to the entirely ridiculous idea that you should hold someone for 45 days without even having to tell them why in anything but the vaguest of terms (don’t forget, 28 was enough). I have indeed been uttering some four letter words but I will still cry out. 45 days makes no sense for a number of reasons. Notably that if it’s really designed to deal with multiple mass terror strikes, like 9/11 or the London bombings, ask yourself who are they going to question? The now dead at their own hand cowards? Anyway, why cannot they charge someone and then continue to question? Do they suddenly stop speaking once charged? Of course not, they don’t speak in the first place. This law is more about the government’s obsessive control than security of a nation which is rapidly becoming unrecognisable in comparison to the one we’re supposed to be protecting in the first place. At least this point isn’t lost on everyone, though that it takes such grand gestures as resigning to make it says something. However, David Davies must still be applauded for attempting to do something, anything, to say enough is enough (yes, I’m going to give him the benefit of the doubt and assume this isn’t a stunt). Hopefully the Lords will follow his lead and throw out this awful piece of legislation. Talking of security, or pseudo-security, we had a bit of a works outing to see the 20-20 cricket at the Oval last night, Surrey losing to Kent. Apparently the heir to the throne was there too. Not that we saw him (few fancy cars passed outside on way in). I don’t know if that meant security was beefed up or if they normally act like this but they did back searches and body searches. Still, with no alcohol allowed in it wasn’t until I opened my bag I realised that my hip flask was in it. Not that I need worry, as it went totally unchallenged. So did the penknife in my pocket, or the spare penknife or little multitool in the never even opened side pocket of my bag. Once again (I remember the science museum doing this but can’t find the post I thought I’d made) a waste of time and money for an illusion of security, which might actually reduce security as perceived risk goes down when it shouldn’t. So, if you want to stab Prince Charles, do it at the cricket. It’s coming, on Tuesday, Firefox 3. Been using the betas and release candidates exclusively for quite a while. It’s awesome. Talking of software, does anyone know a really good alarm program for Windows? I’ve been looking for ages. Ability to control from command line a bonus, as is easily running arbitrary programs. Repeat etc., and snooze, self cancelling, etc…. I’ll leave you with this. I bought some new kitchen scissors the other day, due to mine being ruined by using everywhere but the kitchen. These are the scissors, and the instructions on how to access them!